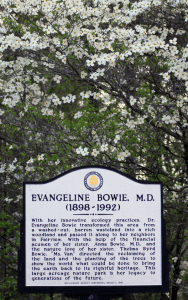 Prior to the death of Dr. Evangeline Bowie in 1992, the City of Fairview was graciously deeded the land that is now Bowie Nature Park. It was her wish that the city make a public nature park out of the 722-acre forest that she had created from land that, at the time of her purchase in the 1950s, was so barren and eroded it was losing over 30 tons of topsoil annually. Her land management techniques included hiring a bulldozer to build terraces, dig lakes and create a hydrology system. Her hydrology system was so well designed that it has amazed even the most highly regarded land management experts. This plan also included the planting of over 500,000 Loblolly Pine Trees. In 2003, Bowie Park Nature Center was completed and opened. The center offers the opportunity for park visitors to learn more about Bowie Nature Park itself with nature exhibits, brochures and art. 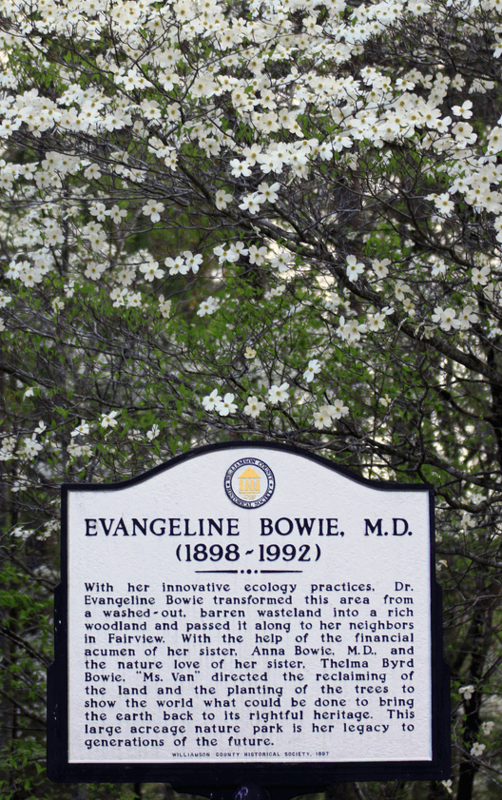 In 2008, Bowie Nature Park and the legacy of land provided by Dr. Evangeline Bowie were placed in a conservation easement where it is protected by the Land Trust For Tennessee. Bowie Nature Park is located on the edge of the Central Basin and on the western escarpment of the Highland Rim of Middle Tennessee. Each of these physiographic provinces is uniquely different, this allows for an unusual mix of biota. There are specific species of plant life in the park that cannot be found as close as Nashville. Within the park there are 17 miles of winding trails which move the traveler through several Eco-Systems to include wetlands, grasslands, pine forest, oak/hickory forest, riparian and lowland bottomland wetlands.